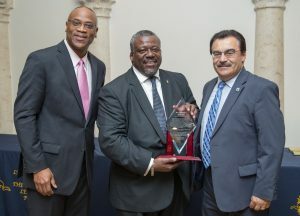 (From left) Michael Deas, director of the Urban Male Leadership Program (UMLP); Cleveland E. Beckett, Jr., assistant director of the UMLP; and José Magdaleno, vice president of student affairs. The first Inaugural Awards and Scholarship Brunch for the Urban Male Leadership Program (UMLP) took place on in late February celebrating the program’s ten-year anniversary at Lehman College. But in the process, also set a fundraising record: the awards raised more than $30,000, surpassing its fundraising goal of $20,000 and was attended by about 200 people. The event, organized by director Michael Deas, recognized distinguished honorees, including the first African-American Mayor of New York City, David Dinkins, and alumnus Lowell Hawthorne, the owner of Golden Crust, the nation’s largest Caribbean franchise. “This was a very proud moment for us,” said Dees. The scholarships offered will be tailored to individual students’ needs, and the first recipients will be announced in May. Available to current UMLP cohort students, as well as alumni pursuing graduate study, the scholarships will include yearlong stipends, special funds for books, and application fees for graduate programs. “I feel a great commitment to serve the students because it is my obligation to give Lehman students my best, said Deas, who is a Lehman alum.